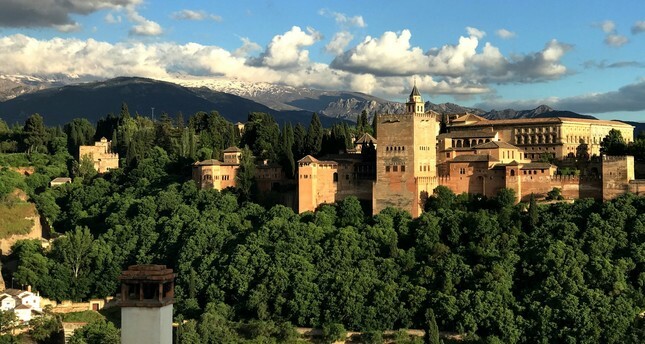 A mosque in the Andalusian city of Granada in southern Spain that overlooks the famous Alhambra Palace attracts more Muslims during the month of Ramadan. The mosque, Mezquita Mayor de Granada (Grand Mosque of Granada), hosts iftar dinners in which people are served dates and Moroccan Harira soup. Mosque Secretary-General Zacarias Lopez Rejon told Anadolu Agency (AA) that they broke Sunday's fast with milk and dates, while Harira soup was served after the Taraweeh prayer. "After the evening prayer, we perform the Taraweeh prayer. During the whole month, the Quran is read from beginning to end twice," Rejon said. Rejon said that the mosque's construction was started by Granada's Muslim community 30 years ago when his father converted to Islam. "We had difficulties constructing the mosque. The process took a long time because of financial and political reasons. Finally the mosque was inaugurated for worship in 2003," Rejon said.